We've been operating since we turned our very first wheel in 2004, since then we've been transporting people from all over the world. One of Scotland's leading coach operators. Mercedes-Benz Touro - 49 Seating Coach. Here at Kingshouse Travel we specialise in providing coaches for hire across Scotland and the United Kingdom. Established in 2004, Kingshouse Travel was originally formed specialising in Home-to-School transport however we have now evolved into a large coach hire and travel management business. Our coach fleet has a variety of sizes including 16, 29, 49 and 53 seating coaches. Our main business, as our name suggests, is coach hire and we have a large client base as well as some major contracts with our key corporate partners. We also provide a variety of other services including operating local service bus routes which also incorporates our demand responsive transport scheme in rural Stirlingshire. As well as this we also operate a large day trips and tours program, and are the largest operator of Alton Towers coach day trips from Scotland. In 2012 we completed the acquisition of 'altontowerstrips.com' and we now continue to expand this exciting product across Scotland. We've already invested in a brand new online booking system to cope with the demand for Alton Towers coach trips from Scotland. 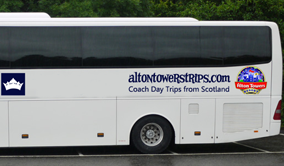 Continued investment and expansion of our 'altontowerstrips.com' brand will see us operate coaches every week from Scotland to the Alton Towers Resort during the 2012 season. Our flexible approach and our innovative use of the latest technology in our modern and fast expanding business helps put us ahead of our competitors and has helped us establish our excellent reputation with our large customer and client base. As a company we have seen some major changes over the years. Originally Kingshouse Travel was part of the Kingshouse Hotel however was soon established as a separate entity due to expansion. When formed, we originally specialised in Home-to-School transport and operated a number of taxis and mini-buses transporting local school children to and from school. After successfully operating taxis and mini-buses it wasn’t long before the expansion of the business started and large coaches ranging from 24 to 53 seating were acquired for the fleet to operate larger school contracts which had been awarded. 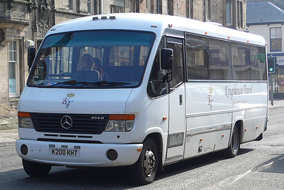 With the introduction of large coaches to the Kingshouse Travel fleet it wasn’t long before the company started expanding into offer private coach hire services for clients across Scotland and the rest of the UK. Looking towards the future unravels an exciting times ahead for Kingshouse Travel as we look to expand our services such as coach hire, public transport and baggage transfers. With the acquisition of ‘altontowerstrips.com’ now complete and fully integrated into Kingshouse Travel we also look forward to growing this exciting and diversifying part of our business. Follow us on Facebook to keep up to date with the latest information and news from Kingshouse Travel. We have over several years coach hire experience and are based just outside Stirling, Scotland. 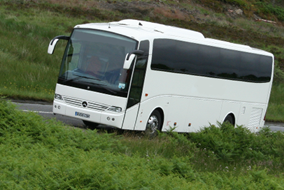 We offer a wide range of coaches from our fleet, from 16 to 53 seating coaches for private, executive and contract hire across Scotland and the United Kingdom.